Traders have accused market bosses of "playing with people's livelihoods" by forcing them out of premises to make way for a new apart-hotel. Work is due to start next year on the redevelopment of George Street in Leeds and current tenants will be forced out. It will mean the closure and relocation of a family-run fish and chip shop that has been run for more than 50 years. Leeds City Council said it had worked with tenants for a number of years on alternative arrangements. 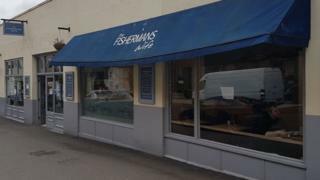 But Graham Reed-Stephenson, owner of The Fisherman's Wife, said: "I'm sickened by what's happening." The fish and chip shop was opened by Mr Reed-Stephenson's parents Jackson and May in 1962. It will close in October and move to new premises inside Kirkgate Market as part of the plans to regenerate George Street, which sits between the market and the Victoria Gate complex and houses a John Lewis flagship store. Mr Reed-Stephenson said because the new site was smaller forcing him to cut the hours his staff work. "I've got six women working for me, four have been here over 20 years and two for over 30 years," he said. "They've all agreed to reduce their hours so no-one loses their job but it's playing with their livelihoods. They've got bills and mortgages to pay. "It seems John Lewis has come into town and the council has forgotten about small businesses." Another trader, Callards butchers, which has been in the same premises for 35 years, has been issued with a formal notice to leave. Manager Kyle Linley said: "We've been offered a new place but it's totally unsuitable. "We need special equipment such as hanging rails for carcasses and there was none of that. It feels like we're just not considered important." The council said it had been working with tenants for a number of years and alternative arrangements had been made for the majority.